'Tis the season to eat summer squash at least once a day. Unfortunately, since the tomatoes haven't come in yet, we've gotten bored with sauteed or steamed squash and can't branch out into my usual favorites --- squash in lasagna and in harvest catch-all soup. At the same time, our basil bed needs to be nibbled on, but since we're no longer using pesto pasta as a standby meal, I have little incentive to pick the delicious herb. Luckily, I discovered a recipe in Possum Living that solved both my problems. I tweaked Dolly Freed's recipe a bit and actually ended up with two different recipes, quite different but both delicious. Since we can't decide which one we like best, I'll share both. First, cut up three or four medium crookneck squash (or summer squash variety of your choice) into moderately thin slices. Saute the squash in two tablespoons of butter until all of the squash is soft and some is a bit brown, adding salt and pepper as you cook. For recipe 1, add three cloves of minced garlic, stir briefly, then turn off the heat. 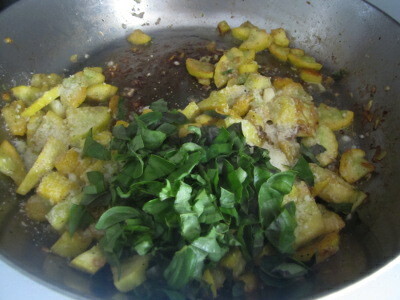 Top the squash off with parmesan cheese and fresh basil. This recipe tastes a bit like pesto pasta --- the garlic is very evident. 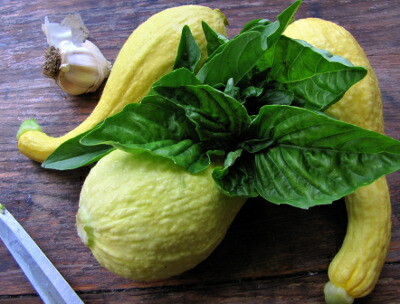 For recipe 2, turn off the heat as soon as the squash is done and mix in a bit of powdered milk and plenty of fresh basil. Stirring should make the powdered milk rehydrate slightly in the butter coating, but the milk will still be chunky. This recipe tastes nothing like mac and cheese in a box but seems to give me that same comfort food feeling, probably because of the sweetness of the powdered milk combined with the butter. Pasta with various sauces used to be one of our quick and easy meals, but since we've been lowering the grain content of our diets, I've discovered that what I'm yearning for when I crave pasta is really the intense flavors of the toppings. 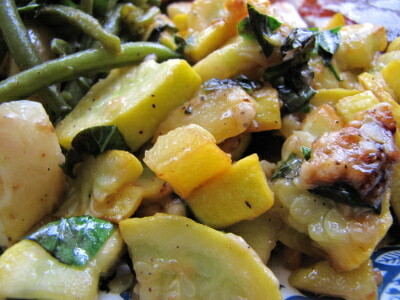 Summer squash seems to be a good venue for pasta toppings, has a higher percentage of protein than pasta does, and a cup of squash provides 18% of your daily allotment of vitamin C. Of course, like most vegetables, squash also has a lot fewer calories than pasta, so you wouldn't want to consider either of these recipes to be a main course or you'll end up hungry. Our chicken waterer is always available to give our flock a sip of clean, cool water.